The Art Therapy Alliance says that “Art therapy is the deliberate use of art-making to address psychological and emotional needs. Art therapy uses art media and the creative process to help in areas such as, but not limited to: fostering self-expression, enhancing coping skills, managing stress, and strengthening a sense of self.” Art therapy has been around for a very long time and was initially integrated into adult inpatient psychiatric units with nonverbal patients or patients diagnosed with a type of schizophrenia. Nowadays, art therapy is utilized with a wide variety of patient populations and found in a variety of treatment settings. And to participate in art therapy, a mental illness of course isn't a requirement. I’d like to think the formula [Art + Therapy =Ex2] is a powerful way to think about the conceptualization of art therapy and how it’s employed. Art therapy allows for the powerful expression (i.e. Ex2) of one’s internal world that can be even more powerful than words alone. Think for a minute if you felt something you had difficulty explaining or expressing, or if something tragic happened to you and speaking about it created a great deal of anxiety, or even yet, you couldn’t speak or had difficulty speaking. In these instances, Art + Therapy = Ex2 can be life changing. From your perspective, what is art therapy? Art therapy is the utilization of art (e.g. painting, sculpture, music, a piece of writing, a dance or movement, or mixed media) as a way to express one’s internal world and conflicts (i.e. perceptions of self, others, and the world) that might be difficult to express in words otherwise. What is it about art therapy that you’re drawn to? What I like about art therapy is that it allows what’s out of our awareness to then be realized in our awareness; verbal communication alone might not be sufficient, especially for those who might have difficulty expressing themselves verbally. The art therapy process tends to soften one’s defense mechanisms (e.g., denial, rationalization, repression etc. ), allowing one’s internal experience to become more known or felt. How do you use art therapy in your clinical practice? Art making, no matter what the medium, can allow for the expression of difficult emotions. The art work itself allows for some distance from the client who created the art to be able to talk about it and its possible meaning(s). Once the client develops some hypotheses as to what the art means, I like to use it as a way to revisit for possible new revelations, which could deepen its meaning and provide more insights into the client’s internal world and conflicts. What is one of your favorite things about doing art therapy? I’m partial to group dynamics and am continuously blown away on how an art therapy group supports itself through the images created; it’s exciting to see participants making meaning out of experiences that may have been buried or only partially understood. In addition, the group may be shocked to find similar imagery in others’ art, thus, creating universality within an experience. Is there a specific art supply you utilize more often with your clients? I tend to utilize fluid mediums such as oil pastels, particularly with adults and teenagers. This material has the fluidity of paint, but is less intimidating. This art form along with the vibrant color allows for safe expressions and regressions of emotional and early childhood states. I also like utilizing collage; using pre-made symbols to create something new is very empowering, and employs the use of Universal Symbols within art making for challenging belief systems in therapy. For instance, Carl Jung, a Swiss psychiatrist, believed that there are symbols which are passed down from generation to generation such as that of the Wise Old Owl, the Great Mother, and the Wise father. There are many symbols in our subconscious that are recognized when we utilize media such as collage (i.e. using images from books or magazines which can be reorganized and put into an art image). This image taps into our subconscious and allows us to reach new levels of understanding about ourselves and our internal conflict(s). What is something profound that you learned either about yourself or your client(s) in doing art therapy? I have learned to always expect the unexpected when using art therapy, especially in the understanding of internal conflicts. This is a journey I am privileged to take with my clients and the journey is constantly surprising. If you were to refer a client to a well-known book/resource what would it be? My favorite book and movie happens to be Orlando, by Virginia Woolf. The story depicts a young man of great privilege in England starting in the 15th century. Over the course of one hundred years, Orlando experiences life as male as well as a female and learns to let go and accept things in life. Orlando learns to respect the ever changing personas that become part of our living experience while still living in truth to who we are and what we have to offer. 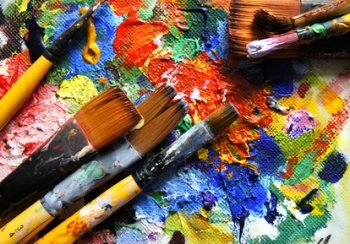 What types of clients seek out or are interested in art therapy? Is there a certain population that responds well to art therapy? Any population responds well to art therapy. Of course children do, as their language abilities are still developing. I find grief work excellent for art therapy. I also love the challenge of adults who may fear the process initially, but find themselves lost within the process. For trauma victims, art therapy aids in the processing of the traumatic event, which aids in the reduction of the trauma symptom presentation. Does a client need to be creative in order to participate in art therapy? It’s not necessary to have ever taken art to find the benefit in art therapy. Art therapy is about expressing oneself—not creating a Picasso. Art therapy is a process driven modality and encourages the client to get lost in the process. It’s not about rushing to a finished product, but about finding aspects of oneself that need and deserve a voice. That's preety impressive blog post. Thanks for nice information.